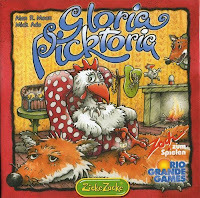 Mick Ado is credited as co-designer on the 1996 release Reibach & Co., which is a German edition of Get the Goods, so I doubt he's responsible for the fox. As is clear from Airlines Europe, not to mention the entire Ticket to Ride series, Moon tweaks game designs endlessly, so I'd bet the fox was his idea. Regarding the fox movement, you are allowed to move the fox even if your three actions are spent. It's very strange, but it is there in the rulebook.